One of my prized contacts at UNIJAPAN Yuri Kubota tells me that she is leaving the organization by the end of the month. She’ll be working from Tokyo with the San Sebastian Film Festival and therefore will be unable to help me with my “maniacal” requests for names of sound recordists and editors (rarely provided on subtitles) of Japanese films. I’m devastated. She says UNIJAPAN’s web database should be able to aid me in most cases. Still, you can’t say hello to a website at a festival market and rapport can take years to build. UNIJAPAN have been gradually building a younger crew who are also helpful but I do hate to see reliable people leave the scene. For about an hour there was an intensity surrounding the Korean and Japanese pavilions at the market. A sudden surge in sales? A sudden drop in sales? No it was the 2009 World Baseball Classic at Dodgers Stadium in Los Angeles where the South Korea V Japan final play-off was taking place. Completely oblivious, I tried talking to people in both booths and they apologized gracefully and suggested I came back later. I happened to come back just as the game finished and the Japanese team claimed victory, 5-3 over the South Koreans. Pictured below is a collection of triumphant baseball fans from the Japan pavilion. Do the respectful thing and avoid mentioning baseball to Koreans until 2013 when the next WBC takes place. YOU WANT ME TO WATCH A MOVIE? Unless the film is a pre-established hot ticket (in which case there is usually a pre-arranged screening, or a locked in for a top festival slot) market screenings can be a lonely affair. Usual suspects at market screenings are rotations of a cast like me, Udine Far East Film Festival’s obayun Stephen Cremin, Michael Campi representing the Melbourne Film Festival and Maggie Lee from “The Hollywood Reporter” and the ubiquitous Jouni Hokkanen from Finland as well as a few others. However empty seats predominate. Whether it be Hong Kong, Pusan or even Berlin so few market players actually go to the movies at markets. If you’re not willing to watch the movies yourselves, (you know projected through a movie camera from a projection booth, not on a laptop while taking phone calls), then how can you expect other people to do the same? At the Japan night party held at Wan Chai’s upmarket The Pawn restaurant (jokes about pawn movies were a staple of the night), Tokyo Film Festival head Tom Yoda concentrated on his festival’s emphasis on climate change issues and the green carpet which was initiated last year and will be replicated this year. 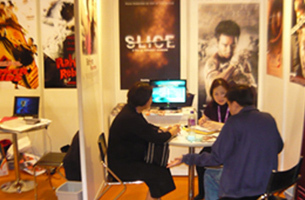 Toasting the Hong Kong Filmart to great success, the party was such a hit that guests showed a distinct disinclination to leave when the function was due to finish at 11pm. Wandering the market corridors I bumped into my fellow APSA Nominations Council member Philip Cheah. Philip refused to buy me lunch on the flimsy excuse that he had already eaten. Despite that we teamed up and interrupted a meeting Bangkok Post critic and Variety reporter Kong Rithdee was having with a Thai production company to see if they had any new screeners (me for review, Philip for Dubai International Film Festival, and both of us for APSA). Neither of us went away empty handed, and I was promised some more in the mail early next week. Of all the pavilions the Thai seems to be the most consistently busy. Melodrama and horror makes the Asian markets go around.